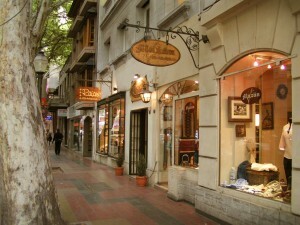 San Rafael is the 2nd largest city in the Mendoza Province with 220,000 inhabitants. 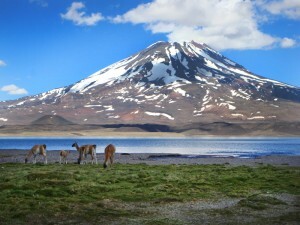 The city is located 240 km from the provincial capital of Mendoza City, and 990 km from the federal capital of Buenos Aires. Natural attractions in the area include the Diamante River that flows through the city, the rapids-strewn Atuel River just south of the city, and Lake Los Reyunos, which is 20 km west of San Rafael. The city and the surrounding area offer a great variety of attractions and activities for all to enjoy. Lake Valle Grande (Great Valley) is just a few kilometers outside the city for example, and it has all the water-sport amenities you could wish for! You can enjoy white water rafting in the river that feeds the lake, waterskiing, kayaking, fishing, boating and of course swimming. Cycling is a favorite pastime in San Rafael itself. During lunch breaks you see groups of cyclists putting in a few kilometers before returning to work. Road bikes as well as mountain bikes are equally popular, and we also have them for hire at the Wine Lodge. Locally a very traditional form of transportation is still the horse. Many fincas (small farms) have horses, and you’ll find their owners leaving the car in the garage and taking the horse to the store down the road instead! Gavilan Wine Lodge currently has two horses which you can hire by the hour. Tour guides are also available with prior arrangement. The shopping opportunities in San Rafael are abundant, but don’t make the mistake of going between noon and 4pm. The centre (Centro) closes down completely, and apart from the occasional restaurant you will not find any shops open. The ‘siesta-rhythm’ takes a little getting used to, but in a couple of days you too will start to really relax and you’ll not want to leave the comfort of your Wine Villa during these hours either. If you head to San Rafael between 6pm and 9pm however, you’ll find the town buzzing with activity. During northern hemisphere summer months, which are of course the winter months here in Argentina, you can take ski trips to Las Lenas Ski Area. The resort is a two and a half hour drive away, and tours can be booked on an individual basis through your concierge at the Lodge. Las Lenas is the second best known ski area in Argentina after Barriloche. Ski equipment can be rented in Las Lenas, or of course you can bring your own. Golfing is another pastime enjoyed locally. At present there are two golf courses in San Rafael; one is only five minutes from Gavilan Vineyards, and the other is a mere 25 minutes drive away. With many of the highest rated Argentine wineries (bodegas) right here in San Rafael, your concierge will also gladly arrange a private guided tour for you with some of the best wineries. We recommend visiting the private cellar of Bodega Rivier, which is currently run by a former Swiss immigrant. His family started the vineyards in the 1950s and they have now started selling their wine worldwide. Bodega Rivier is known for its excellent white wines and a fabulous Rose Malbec. All of their wine comes from only their own vineyards. Bodega Bianchi (Bianchi Winery) is the largest sparkling wine producer in the area. Their winery is just a few kilometers from Gavilan. They offer guided tours in English and Spanish. Bodega Suter (Suter Winery) is another winery just a few kilometers away. 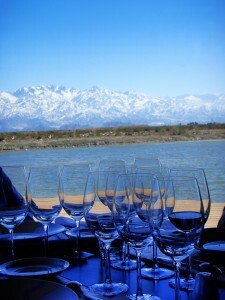 Suter produces mainly the best-known wine in the Mendoza area, the Malbec. The Malbec grape came originally from France, and is a lesser-known vine varietal in Europe, but it has proven to be an excellent vine for the climate here in Argentina. It produces an exquisite red wine with great character, and it’s a great alternative to the typical Cabernet Sauvignon and Shiraz. Besides the wine heritage locally, olives are typical to this area as well. A Spanish company discovered the perfect climate for growing olives just outside San Rafael, and bought up thousands of acres of land and planted probably the largest olive orchard in the world. A local company that’s been in the olive oil business (aceite de oliva) for generations has its factory and olive orchards just at the entrance to San Rafael, about 10 miles from the Gavilan Vineyards; and since 2008 they’ve been offering guided tours through their facility. The tour is crowned by a tasting in the middle of the olive orchard where you can enjoy ham and cheese, along with the company’s own olive oil and unique balsamic oil, which is a form of balsamic vinegar but which is produced entirely differently and has a special smooth taste to it. Both the oil and the balsamic oil are served in our restaurant. The olive oil is so pure and delicious that is can be best enjoyed simply by dipping a piece of white bread into it. One of the nicest times here in San Rafael is harvest time when our vineyard is getting ready to be harvested. ‘All hands on deck’ is our motto, and our 45 hectares produce up to 500,000 kilos of grapes. All of them need to be picked within the month of March. Since harvest time depends on nature and the sugar content of the grapes, no definite date is set – but anywhere from March the 1st to March the 31st is our main harvesting period. During harvest we increase staff on the property, and as a unique experience guests can take part in the harvest too. Just grab a crate and a knife and become a part of our harvest team. It’s one of the most fulfilling experiences you can imagine. You will enjoy it even more because you can quit whenever you want to, unlike our employed workers! Gavilan Vineyards and Wine Estates, a 85ha (210acre) complex with a 42ha (110acre) vineyard, and 14 exclusive wine estates of 2ha each, offered to wine enthusiasts. Copyright 2010 - 2018© GAVILAN VINEYARDS, LLC. All rights reserved.